Does your kids' wintertime fun involve getting bundled up against the chill and racing downhill in a sled built for two? 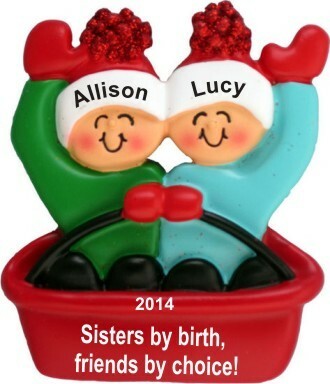 The adventures in sledding sisters Christmas ornament personalized as a special keepsake features a pair of bright, happy faces beneath Santa caps adorned with their names. 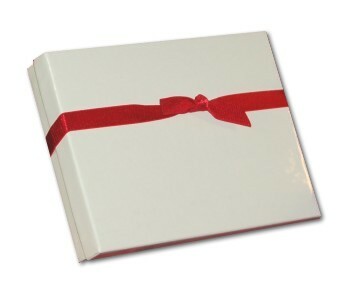 It's a personalized kids ornament, so we'll add the details you provide. They'll be painted on by hand in an artistic font that creates a one-of-a-kind memento of these precious days. The artist will add a longer message on the back at your option. Keep great memories fresh through the years with the sledding sisters Christmas ornament personalized for the girls and arriving in our classic gift bag.